and in the front office for teams in the Central Hockey League and with the Washington Capitals. team basically from scratch, really, and that's the approach McNab took. well, with the biggest prize coming in 1984, when he chose Kirk Muller with the #2 pick in that draft. the depth at goal, because he was drafted by Billy MacMillan in 1983. The end result was even though still no playoffs, the Devils did get progressively better each year. post in 1987. McNab would hold that job until he retired in 1994. 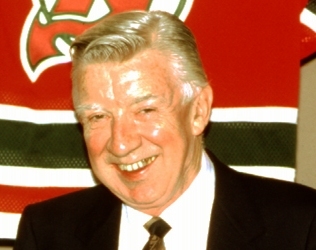 He would win the Lester Patrick Trophy, awarded by USA Hockey and the NHL, in 1998. He would suffer a stroke in 2007, which lead to his death.